You are here: Home / Damp / The Rising Damp myth is….a scandal; like yesterday’s MMR scare. 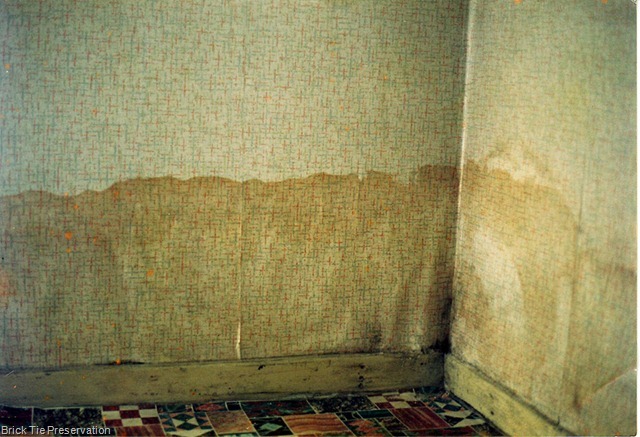 The Rising Damp myth is….a scandal; like yesterday’s MMR scare. Rising damp is a myth, some say. Not many really think so; that would be stupid, but those who believe this nonsense seem to have the ear of the press and the ear of RIBA and RICS too. So instead of being drowned out by howls of derision from the those who really know about these things, they gain publicity and even a bit of notoriety too. 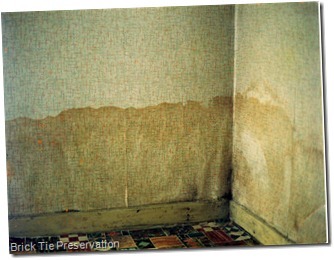 Yet every day – yes every day, rising damp causes damage to our housing stock. It causes salting of brickwork, wet rot in floor joists bearing into affected walls, perishing plaster surfaces and even increases heat loss at the base of walls. Now then, you may disagree with me. Perhaps I’m just spouting an opinion too, like the ‘myth pushers’, but no, I state facts, facts proven time and again by me and importantly, by people who have really studied the phenomena scientifically. The internet is full of papers which detail various trials and careful studies done, in an effort to quantify the nature of the problem and analyse the effectiveness of treatments. They are being ignored. Who cares? Well we all should be worried, because when people read something in the papers they tend to believe it. If building preservation ‘experts’ generally agree on something and one or two of them suddenly start babbling an unsupported view, with no proper evidence, the papers like to publish it; conspiracy and corporate culpability sells so well. Unfortunately the readers get the information in an unbalanced way. They then become prey for all sorts of crackpot ways of dealing with their ‘mythical’ rising damp problems. As a result, I see people turning away from proven chemical damp-proof courses, just at the point when the technology of these systems has begun to deliver much better results. You see, chemical DPC’s have a bad press, because too many were installed improperly, by badly trained and sometimes quite iffy installers. Often no plastering was done, so the nitrate and chloride contaminated plaster just sat there; soaking up more humidity and the walls never dried out. Many DPC’s were installed for the wrong reasons; they can’t eliminate condensation or penetrating damp, or rising damp; if the cavity is blocked. This is not the fault of the material or proof that rising damp does not exist – it is the fault of the installer or the surveyor involved – or both. Now that we have better training and the advent of DryZone DPC injection cream, standards and success rates are far higher. This is good – but because of the bad and completely unjustified attacks on the whole premise that damp rises – customers are being bamboozled into trying unproven, unreliable and generally more expensive ‘cures’. So this is where the MMR scandal link is. The scandal was caused by poor and unproven opinion being disseminated as science fact. Before long, others jumped on the bandwagon and thousands of parents (many of the them middle class Sunday paper readers), decided that young Rupert and Felicity shouldn’t have the nasty jab. This directly caused the severe illness of many other children and eventually those who had promoted this were shown for what they were – the main doctor was struck off the medical register. In my opinion RIBA and RICS members who seem to support this current ‘myth’ nonsense should have a read of some proper evidence. As professionals we have a responsibility to give good advice to clients; advice based on facts; advice based on knowledge. Opinion is no substitute for fact; experience is no substitute for knowledge. It was this piece, plus an essay here http://rspa.royalsocietypublishing.org/content/463/2084/1871.full that persuaded me the problem is not a myth. I have already requested a survey via your company site, and have looked at Safeguard Europe Ltd products. Do let us know. I too have some good photos of damp staining up the wall like yours but the last thing I would describe it as is “Rising Damp”. I want to solve the damp problem but not get caught up in the description or direction of the dampness. I have a great idea. Lets just call the dampness “Internal Dampness” and not differentiate. A good analogy would be asking someone where they lived and they replied “Up the road”. It doesn’t help clarify where the person actually comes from. Finding out WHERE the person comes from is useful. The same is true for damp. The source of dampness is critical the damp pathway is secondary what you call the dampness is irrelevant. The term “Rising Damp” is a meaningless directional description. I think the Rising Damp Myth people are probably poking a bit of fun at those devotees of the term. The myth people have a very specific definition of Rising Damp which I think the remedial damp companies have overlooked. Rising Damp = moisture travelling up the brick wall (not the plaster) via a defective DPC. Now if one is really serious about removing the damp problem (not just covering it up) you have to be more analytical about the terminology you use and say the source of the dampness is X and the damp pathway is Y. There seems to be a misunderstanding amongst the two camps in this issue. On one side, the remedial companies want to sell a remedial treatment to solve the problem (which is great), while on the other side you have mostly the conservationist who have a philosphy of minimum intervention. I often find it amusing when those on the Rising Damp camp show a picture of brick piers sitting in a trough full of water in the laboratory with a couple of courses of wet bricks shouting Eureka!. This is followed by some equations and some graphs. Bricks soak up water what do you think would happen? Tell me something I don’t know! Now here’s the rub for the lab experiment. 1st describe the couple of courses of damp bricks “Internal Dampness” and ask yourself what’s the damp source and what’s the damp pathway? The damp source is the trough of water and the damp pathway is the brickwork sitting in the trough. Now the Rising Damp Camp would inject the damp wall to stop the moisture being sucked up by the bricks, but the conservationist camp would get rid of the water in the trough, because drilling holes in 200 year old brickwork and injecting modern chemicals into it, to a building conservationist, would be the worst abomination one could imagine. Worse than having a damp wall. Have a think about what I have written and just try not to use the “Rising Damp” term and instead think Damp Source, Damp Pathway and Internal Dampness. Thanks for your comment on the ‘The Rising damp myth’. You raise interesting points and there is plenty for us to agree about. Good diagnosis is crucial and sadly, it is often missing, where damp issues are concerned. However, I think maybe you took some of it a little too literally. The article is really a rant, brought on by my own indignation at the ‘myth pusher’s’ derogatory statements about my industry. If you spend 34 years working in an industry; getting qualified, helping customers and staff, you naturally can get touchy…when you are described as ‘nothing more than charlatans;. A bunch of double glazing salesmen…”. Clearly this is wrong, though there are quite a lot of cowboys in our industry, the reasons for this are complex and there are many dedicated, knowledgeable and honest people working in it too. They struggle to run successful business and provide stable employment, in the face of unfair competition from unqualified and unscrupulous ‘specialists’ who pop up all too frequently. Customers hate cowboys – but you should try running a reputable and responsible business alongside them – it is bloody hard. Polarisation of the argument has been the result. The “Rising Damp myth” simply became a vehicle for slagging off me and my ilk – I object to this. Later ‘the myth’ has been hijacked by interested parties, wishing to profit; holding seminars to teach surveyors the ‘truth’ about damp – for a fat fee. I attended one or two of these and I can tell you George, the level of expertise on show was lamentable; talk about the blind leading the blind. With regards to X & Y and ‘pathways’, which is an excellent point. Good specialists already apply this and many of my reports refer to ‘bridging’ and such or talk about ‘Rising damp-like symptoms’, caused by these defects. I and others too, will then specify how these defects can be approached. No chemicals required! It still means that occasionally we are left with damp, wicking up walls, sometimes without any assistance or visible defect. This is Rising Damp and for now, until convinced otherwise, I’m going to use the terminology which best fits it. Keep up the good work George and please do look in again. In my limited experience I’ve seen many people spend thousands on rising damp to no success. In every case the problem has been fixed by “cheap” builders fixing guttering, clearing away ground or improving drainage. Lewisham council pays a reward for anyone finding actual rising damp which has never been claimed. To me whether rising damp exists isn’t the issue – I’ve just never seen it where it can’t be prevented by cheap simple means. I can see your point of course; if you haven’t seen rising damp, fair enough. I’ve seen lots of damp diagnosed as rising damp in my home county of Yorkshire, when in fact it’s nothing of the sort. As you say, leaking gutters and such all cause problems. The scandal has been the fact that for many years, some so called ‘damp specialists’ (and I am one), went around telling everyone that they needed a new DPC, when clearly what they needed was either the path lowering or new gutters. That said, Lewisham and some other authorities are just as guilty for being too lazy and complacent in the first place; if they’ve approved installation of hundreds of chemical DPC’s in their housing stock on the say so of specialists, only to find out later that the damp was condensation, then they’re complicit in the deed. Such incompetence would be rewarded with the sack in private industry. Has anyone apologised or been held to account for wasting all that money? No. What they’ve done is erect a smokescreen by slagging off the industry they invited in and trusted in the first place. They must have been chuffed to be handed a lifeline by a consultant who could tell them that rising damp doesn’t exist – what a find! Even now I come across some council’s rubber stamping damp proofing works which are totally unnecessary and obviously flawed……… morons is a word which springs to my mind. No wonder they and some ‘consultants’ are now so vocal in bashing my industry – even claiming rising damp is a myth! I’m afraid that their pants are really very singed indeed and no amount of blustering will hide it. The whole purpose of my blog is to promote good practice by promoting good diagnosis and give consumers real knowledge. This will squeeze the cowboys out of the industry. If more people considered all the evidence in the same way as you do then none of this myth malarkey would have happened, so despite the fact that I’m a damp proofing specialist I welcome the attention the myth mongers have brought to the fore. Even so, as I survey houses for damp and timber problems in and around Leeds, I see lots of cases of really bad, sometimes totally crooked damp diagnosis (see this recent case near Pontefract)…we’ve a long way to go. A very well worded, spot on article, as was the reply. Well said Dry Rot! Very agreeable, too. Working in the industry in a customer/technical sales based role (rather than an actual surveyor role) I have found this blog to be most useful when encountering the claims of the proponents of the “myth”s, when they have come via customers who have been led on by this nonsense. As an aside note, one does find it amusing some of the emotive language these people will use to put across their argument – making them sound desperate in the process. A certain company with the initial HH comes to mind!